From not really knowing much other than plants need sun and water to grow, I’ve learned a ton especially under the guidance of Kevin at The Garden Spout in Portland, Oregon. As you’ve probably noticed there are some gaps in my Posts, so I’ll be filling those in from my notes and conversations with my “Master Gardener” to give you more insights into what I’ve learned and how HydroRush can really make a difference in your Garden. For now, you get this picture of a large bush of Pepper Plants. 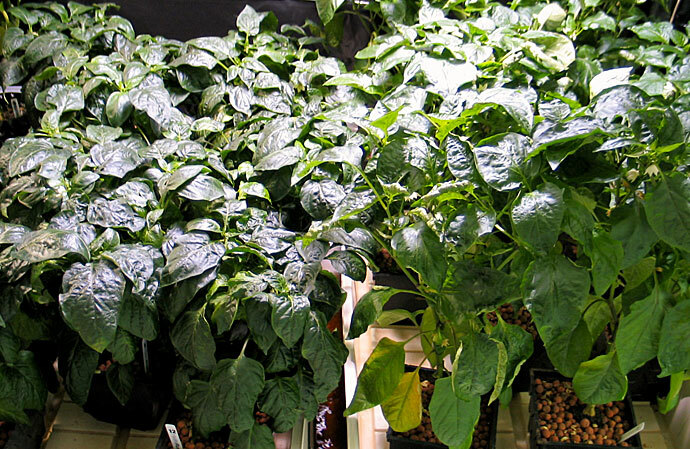 What we’ve decided to do for several reasons; mostly for plant health is to cull the Pepper Plants and keep the “Heroes” in Hydro and follow those all the way through to their final harvest. We’ve decided to toss the Soilless Pepper Plants; the Edema got the best of them and they never fully recovered although we did get quite a bit of fruit development from them, but they were just too far behind to catch up with the Hydro plants. So, here’s where we are now with new data below. Stay tuned more surprises next week = We’re really not done. We have another growing test to show you now that “Spring” (hint) is here. Which of these two trays look healthier to you? This chart illustrates our current “State of the Union” with our “Final Four” (4) renumbered Pepper Plants (for those of you following this closely). I tried to pair plants that had equal if not close to the same number of Fruit. We’re committed to taking these all the way through to harvest and I may even call one of my Cullinary School Graduates to help us with a taste test. Stay tuned and find out. As you can see the untreated plants have a slight edge with a total of 3 Fruits behind the treated pepper plant group. We;ll be weighing the harvests at the end too. All growing equipment and resources generously provided by Hank Carver and Kevin Price at The Garden Spout, Portland, Oregon.